School isn’t what it used to be. Chalkboards have been replaced with SMART boards. Pencil and paper have become Chromebooks and tablets. It’s only a matter of time before virtual reality education can be found in every classroom across the country. The benefits to this educational approach are endless. Virtual reality brings students to another world, another level of understanding, right inside the classroom. All students learn at a different pace and in different ways. Some are visual learners, others work best with hands on stimulation or verbal commands. Virtual reality education will help bridge the gap between these students. Here are 5 reasons why schools need to consider and implement this revolutionary form of teaching. How many of us have heard these words from a student – “I’m bored.” Teachers work tirelessly to engage students through interactive games and projects, group work, public speaking and a multitude of other avenues. Often times their efforts fall flat. To say virtual reality would make class interesting again is an understatement. It would also allow teachers to bring lessons to life. Students would experience hands-on, real life encounters that will prepare them for the future. Imagine transporting a child to the ancient ruins of Pompeii, the sunken wreck of the Titanic or the Great Wall of China? No school budget could sustain these adventures, but virtual reality education can make it happen! Children would have the opportunity to have once in a lifetime experiences. Virtual reality can also help prepare students for the future workforce by teaching real-life skills. A scenario designed around a current lesson on topics such as specialized training, vocational jobs or nursing can be “practiced” and experienced using this technique. Technology has transformed the classroom in recent years. Students have gone from passive learners to active learners. There’s no denying that in order to be successful in the 21st century, students need efficient technological skills. It’s not often you see a child under the age of 4 that isn’t swiftly navigating a tablet faster than any adult. The benefits of virtual reality are in fact a reality! Because most students can easily navigate virtual reality they feel accomplished. It’s a rewarding experience, which means a positive one. If children feel confident in their ability to learn, they will continue to seek out further enriching experiences. A student can also be whoever they want to be in the virtual reality world. Race, gender, and age don’t matter. They are free to be themselves and feel accepted. This opens up doors for learning in new and different ways. Virtual reality education puts the power in the hands of the learner. They are allowed to make decisions and adjustments in the alternate “universe”. Students experiment with their creativity, prompted by their curiosity of how things work. All these factors link to critical thinking and increased retention. The entire experience brings learning to another level. 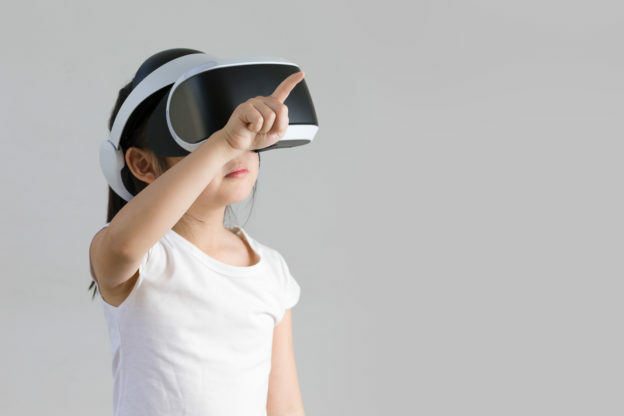 According to a survey conducted by Samsung, 93% of teachers in grades K-12 said their students would be excited about using virtual reality in the classroom and 83% said virtual reality might help their student’s educational outcomes. Those are some impressive percentages and even more reason to give virtual reality education a chance!